Faith Christian Center provides Baby Dedication for children of families that are members aged 0-6 years old of FCC. Children are a gift from God (Psalm 127:3). There is no single moment in life when this is more apparent than at the birth of their child. Understanding this truth, we believe that presenting and dedicating a child to God should be as natural to Christian parents as burping a baby after he is fed. Baby Dedication is a scriptural practice. We read in the Gospel according to Luke (Luke 2:22-33) that the parents of Jesus dedicated Him unto the Lord on the eighth day as the Law had prescribed (Leviticus 12:1-4). Also in the Gospel according to Matthew (Matthew 19:13-14), we read about how people brought their little ones to Jesus so that He might place His hands on them and pray for them. Following the scriptural example of Jesus, during our Baby Dedication Service, Pastor Sean Moore prays and lays hands on each and every child pronouncing the Blessing of God upon their lives. Parents and guardians publicly acknowledge God’s ownership of their child and pledge before God and His people to bring up their child in the nurture and admonition of the Lord. 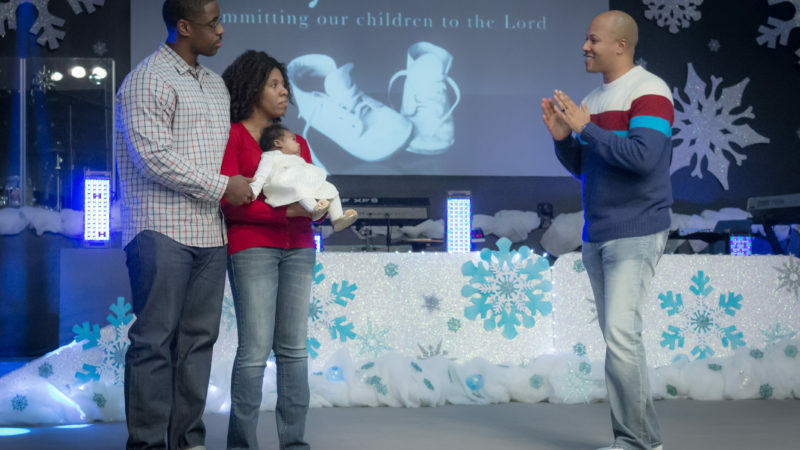 Faith Christian Center provides Baby Dedication for children of families that are MEMBERS of FCC. Baby Dedication is held the first Wednesday of every month.